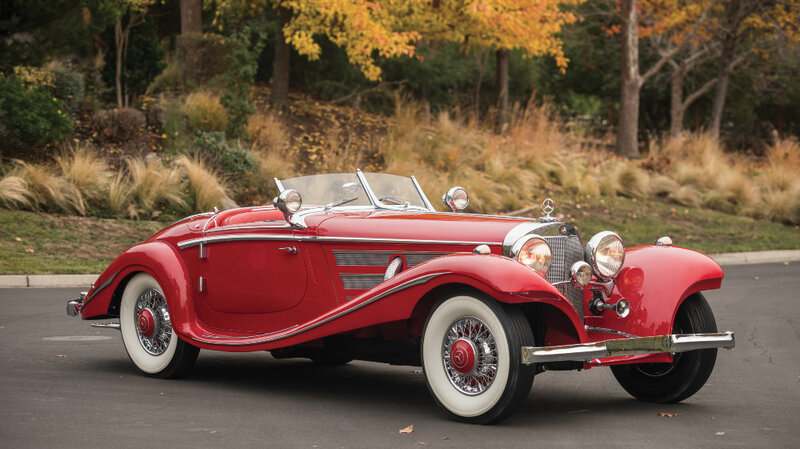 A 1937 Mercedes Benz 540 K Special Roadster and a 1929 Duesenberg Model J Convertible are the highlights of the 2016 RM Sotheby’s Arizona classic car sale. The Mercedes Benz has a pre-sale estimate of $10 to $13 million. For once, Ferraris are not expected to be the most-expensive cars on offer at an RM Sotheby’s classic car auction. 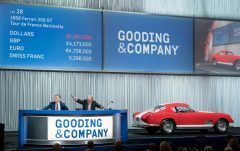 At the Arizona sale during the traditional January Scottsdale classic car week, the dearest Ferraris on offer at RM Sotheby’s this year are a 1965 Ferrari 275 GTB and a 1985 Ferrari 288 GTO (estimates $2.4 – $2.8 million). A 1930 Rolls-Royce Phantom II Torpedo Sports by Barker and a 1965 Shelby 427 Competition Cobra are expected to fetch more. In 2015, RM Auctions generated $63.7 million in sales at the two-day Arizona auction. It also set the Arizona / Scottsdale classic car week auction record at $9,625,000 for a 1964 Ferrari 250 LM. Mercedes Benz 540 K Special Roadsters are amongst the most-desired cars ever made. A 1936 Mercedes Benz 540 K Special Roadster sold for $11,770,000 at the 2012 Gooding Pebble Beach sale as still the most-expensive Mercedes Benz road car ever. The 1954 Mercedes Benz W196R Formula 1 car that achieved almost $30 million at the Bonhams Goodwood Festival of Speed 2013 sale is the only other Mercedes Benz car ever to have sold for more than $10 million. The 1937 Mercedes Benz 540 K Special Roadster by Sindelfingen on offer at the RM Sotheby’s 2016 Arizona sale is an original US delivery car with known history. It has the desirable longtail and high door configuration. It is one of the earliest 540 Ks made and may have been in effect a pre-production demonstration model. The car is believed to have covered only 10,277 miles since new. The 1929 Duesenberg Model J Disappearing Top Torpedo Convertible Coupe by Murphy (est. $3,000,000 – 3,500,000) is one of only six built and has many unique features including the one-off tail design. The car has its original body, firewall and chassis. It has covered only 17,000 miles since new. The Duesenberg originally belonged to the Gray family, who invested $10,500 in Ford in 1903 and sold the shares back to Ford in 1919 for $26 million. The 1930 Rolls-Royce Phantom II Torpedo Sports by Barker (est. 2,500,000 – 3,500,000) was a one-off design intended for Continental touring, The first owner was possibly the Maharaja of Rewa – Indian royals were top Rolls Royce customers prior to the Second World War. The Rolls Royce is in a fully restored condition and retained its original “GJ 11” British registration.